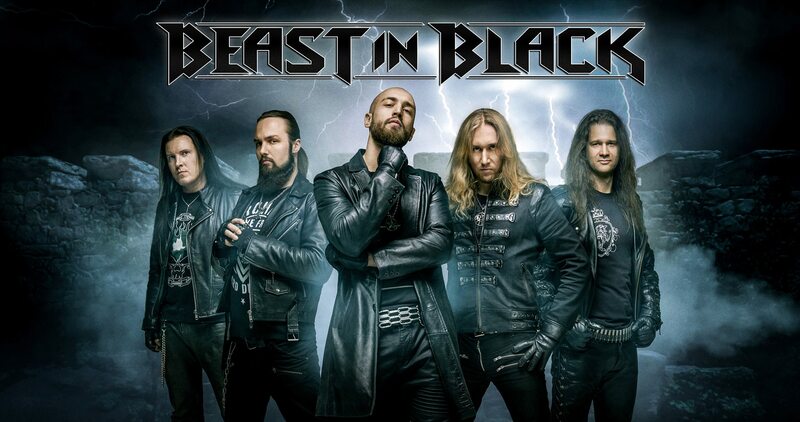 Beast in Black is a Finnish heavy/power metal band, formed in 2015 by guitarist/backing vocalist Anton Kabanen, who started the band after parting ways with his original band, Battle Beast that same year. With Beast in Black, Anton wants to continue with the signature sound he started with Battle Beast, and has brought in Wardrum vocalist Yannis Papadopoulos to achieve the kind of sound he wants. Their debut, Berserker, is set to be released in November of 2017, with the lead single Blind and Frozen being released in September. The combination of heavy/power metal is one that’s obviously been done a lot over the years, originating with the likes of Grave Digger, Primal Fear and others, but while some bands within that style can be fairly predictable, others have found ways to innovate and throw in many surprises to help take their music to the next level. Anton has continued evolving his sound and managed to create possibly his best album to date with Berserker in 2017, an album that picked up from where he left off with his former band, while also moving in a new, more keyboard driven direction, and throwing in a ton of surprises to help make it feel equal parts fresh and familiar, in the best way possible. Now, nearly a year and a half later, he’s back with the second Beast in Black release, From Hell With Love, and this time he has taken things even further, creating his catchiest, most consistently entertaining album to date, and one that builds upon everything that made the previous release special and improves upon it, resulting in the first masterpiece I’ve heard in 2019! 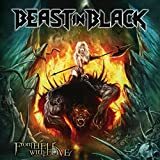 Fans of Berserker, as well as the second and third Battle Beast albums, should have a pretty good idea of what to expect here, as From Hell With Love is very much in line with any of Anton’s previous releases, stylistically. So, you can expect to hear a nice mix of heard hitting guitar work, speedy power metal tempos, some more mid paced rhythms, extremely fun and catchy choruses, and an extremely wide range of keyboard work, with everything from more modern electronic keys, to classic 80’s synth and even some parts that go into disco territory. Yes, Anton clearly loves 80’s music, and so his albums always have a ton of that influence to them, with this one being no exception. Apart from the weird dance elements, there’s also hints of classic AOR on a couple tracks, which was also true of the debut. At the same time, fans of heavy metal can still expect some heavy guitar work at times, as well as some more epic, melodic heavy metal, to go along with all the catchiness and keyboard insanity. Performances are absolutely amazing across the board, with the keyboards in particular standing out, once again, though the guitar work is also impressive, being equal parts heavy and very melodic at different times, with some of the solos in particular being technically solid, but also quite beautiful. Songwriting has proven to be one of Anton’s biggest strengths over the years, and so it’s no surprise that this album is both consistently engaging, and extremely varied, with some faster tracks,some more mid paced tracks, a ballad, a couple of tracks that lean heavily into that kinda disco mixed with AOR sound I described, and in general the songs are just ridiculously fun and addictive, just like with the debut, except where that release had a couple tracks that didn’t quite impress me, this one is absolutely flawless. In fact, that’s the one real difference here: Stylistically, it’s very much in line with Berserker, and it doesn’t have anything as surprising as “Crazy, Mad, Insane”, but on a song to song level, the level of energy and excitement never slips even in the slightest, and so that’s what helps make it an even better release than the band’s already amazing debut. I think track placement is the key, here, as there are no points where the pacing slips off, thanks to the tracks being placed in such a way that you’re never getting too much of one sound right together, which was the only slight complaint I had with the debut. Obviously, the production is absolutely perfect, and everything sounds amazing, as usual. One other area that’s as reliably great as ever, is the vocals. Yannis Papadopoulos had his major breakthrough performance on Berserker, after being with a couple other bands previously (most notably Wardrum), and doing a solid job, but he was certainly never as dynamic or as exciting before as he was on Berserker. This continues on From Hell With Love, as his full vocal range is once again on display, with him doing everything from crazy falsettos, to lighter, more melodic vocals, to some very soft, almost feminine vocals, to some pure, intense heavy metal vocals. The amount of range he displays is spectacular, and the fact that he can pull everything off so fluidly, so seamlessly and with so much skill in every area, just goes to show how great a singer he truly is. While the music is already excellent, Yannis definitely takes the songs to the next level, and is one of the absolute best things about the band, along with the keyboards and songwriting. 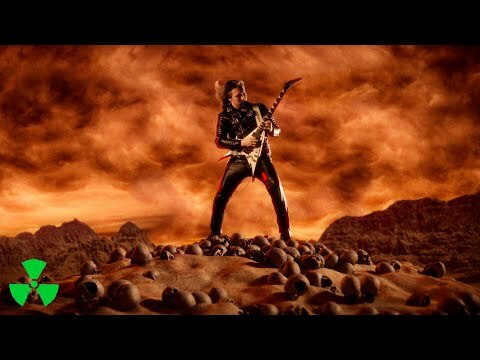 Speaking of songwriting, the album wastes absolutely no time at the start, opening up with one of its best tracks in “Cry Out for a Hero”, a speedy, epic, bombastic power metal track, with an insanely catchy chorus, with a great mix between some of Anton’s heavier guitar work, as well as some 80’s sounding synths. Yannis mostly sticks with his wild heavy metal vocals and falsetto on this one, and excels during the chorus, while Anton provides a very melodic and beautiful guitar solo in the second half. Overall, it’s a very fun track, and an excellent way to start the album. Things start taking a (not so surprising) turn for the weird with the title track, with some very 80’s sounding synths, and a beat that certainly falls into disco territory. Yep, this is a fun, mid paced stomper of a track with a very retro sound to it, mixing some occasionally heavy guitar work, with disco beats, cheesy keyboards and a very fun, insanely catchy chorus. It’s the exact kind of thing that Anton has proven to be an expert at with his past couple of albums, as well as being very unique in the metal world, and being one of the things that helps make Beast in Black distinct from any other metal band, as it’s certainly not something you’ll ever hear from anything else. Up next is another 80’s sounding track in “Sweet True Lies”, the lead single. It has a classic AOR sound, with some very melodic guitar work, as well as an extensive use of synths, though not in the kinda bouncy way of the title track, but in a more relaxed way, as is common for the genre. It has a slight hard rock edge to it, and the main melody certainly reminds me of some Bon Jovi tracks. It’s a very fun, insanely catchy track, with an amazing chorus, and it shows Yannis expertly alternating between his softer and more powerful vocals. 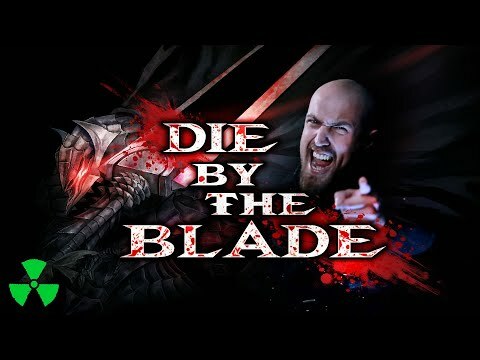 The second single, “Die by the Blade” is also very old school, with more of those cheesy, yet absolutely delightful keyboards, though it’s a slightly more upbeat track, feeling like 80’s music mixed with modern power metal, in an absolutely amazing way. It moves at a slow pace during the verses, before speeding up and becoming quite intense and epic during the chorus, and it has another melodic, technical and beautiful guitar solo in the second half. In between those two tracks is “Repentless”, which must have had the band borrowing a dictionary from Slayer. Anyway, it’s another insanely fun, very epic track, with an extensive use of sytnth horns, as well as having a slight symphonic feel to its keyboards. It’s one of the more modern sounding tracks here, and it moves at a great pace, with a pretty fast, heavy and insanely addictive chorus, while Yannis stays mostly aggressive with his vocals, getting slightly theatrical during the chorus. It’s a really fun track overall, and probably one of my favorites. The lone ballad of the album is “Oceandeep”, and it’s another track with a slight use of symphonic elements, while being a very beautiful, mostly acoustic guitar led, track with some amazing soft vocals from Yannis, where he uses some of his more feminine sounding vocals to great effect early on, before opening up with some more powerful vocals towards the middle, which gives way to an absolutely amazing, very emotional, guitar solo, before the song closes out fairly quietly. I find it to be slightly better than “Ghost in the Rain”, from the debut, though perhaps having it in the middle of the album, instead of the end, is a part of that. Moving towards the end, we have “Unlimited Sin”, which is yet another song driven by 80’s sounding synths and a slight disco feel, with a very cool rhythm to it, while still having a metal edge and having some strong vocals during the verses, which lead into one of the catchiest, and most amazing choruses on the album. It’s yet another insanely addictive track, and probably one of my favorites here. However, things only get better with “True Believer”, a song which combines classic AOR and power metal in the absolute most delightful way possible. In fact, it reminds me a lot of Dragony’s cover of the David Hasselhoff song “True Survivor”, except it’s somehow even more epic and more insanely fun and catchy than that was, with the keyboards just sounding amazing, and Yannis totally steals the show during the chorus, being slightly edgy, yet still melodic and very smooth at the same time. It’s one of the most hopelessly addictive songs I’ve ever heard on a metal album, and it manages to be equal parts retro and cheesy, yet still heavy at the same time. I think only Anton would be crazy enough to attempt such a thing, but I sure am glad he did! Moving back into heavier territory, “This is War” is an epic, mid tempo heavy metal song, with some heavy guitar work during the verses, before opening up for a very melodic and catchy chorus. It’s one of the more guitar driven tracks here, with another great solo in the second half, while still having some nice sounding keyboards, during the choruses, and in a really beautiful section near the end. It also references Battle Beast’s debut in the lyrics, which is pretty neat. After that is “Heart of Steel”, which is every bit as epic and cheesy as its name would suggest, bringing in some more delightful 80’s sounding synths. It’s a more relaxed track, moving at a fairly slow pace during its verses, while picking up slightly for a heavy, yet very epic and fun chorus, where Yannis shines, as always. It gets more epic as it goes along, with the second chorus being more eventful than the first, bringing in some choral elements, and then the solo section is quite amazing, as usual. Closing out the album is “No Surrender”, a fast paced power metal track, which manages to strike a perfect balance between heavy guitar work, light sounding keyboards and some amazing vocals from Yannis. In fact, the chorus might be some of his best work on the album, as he’s equal parts intense, epic and very melodic at the same time. Of course, the chorus itself is incredible as well, and the song has some of the best melodies on the album, while also being one of the heavier and faster tracks. It’s probably my favorite, just because I love speedy power metal when it’s done perfectly, as it is here, though every song on the album is fantastic. It, of course, has another very melodic, and very beautiful guitar solo, with some of Anton’s best work on the album, and overall it’s a much stronger finish than what their debut had, which is probably another reason I’d give this album the slight edge over that one. The physical digipak edition includes two bonus tracks, which are covers of “Killed by Death” by Motorhead, and “No Easy Way Out” by Robert Tepper, though neither of those are on my promo copy, so I can’t comment on them. I was expecting a lot from Beast in Black, after their debut proved to be amazing and by far my favorite release from mastermind Anton Kabanen up to that point, but I was not prepared to be as completely, utterly floored by From Hell With Love as I have been! It’s an absolutely flawless album, which seamlessly blends together elements of heavy/power metal, with some classic 80’s sounding synths, some disco beats, and all kinds of epic, crazy melodies. Fans of the debut, as well as the first three Battle Beast albums, shouldn’t need me to tell them this one’s a must hear, while fans of heavy metal and power metal looking for something fresh and unique, as well as anyone looking for an incredibly fun and addictive album, should definitely give this one a try. I’m sure there will be many great releases to come in 2019, but Beast in Black have certainly set the bar very high! It’s always interesting to see what happens when an important songwriter for a well-established band suddenly splits up with his bandmates and goes his own way. In such a scenario, it’s interesting both to see what direction the remaining members will take with their sound, and also see what the departing member will do with any future projects. The latest case of this happening is with Anton Kabanen, main songwriter of Finnish heavy/power metal band Battle Beast for their first three albums. After having disagreements with his bandmates over which musical direction to take, following their third release, Unholy Savior, he left the band to pursue his own vision, while the remaining members decided to keet the band going. Two years later, Battle Beast has already released Bringer of Pain, their first album without Anton, and it proved to be a solid release that took the band in a catchier, more melodic direction, while Anton has started his own band Beast in Black, who is now set to release their debut, Berserker, in early November. I had high expectations for this album, as Unholy Savior is my favorite Battle Beast album to date, and I’d been waiting to see what Anton would do next. I’m happy to report, Berserker does not disappoint in the least, and manages to both continue with the sound established on Unholy Savior, while also continue to explore new territory, sometimes going in shocking directions, but somehow managing to make all of it work. Anton’s songwriting has evolved quite a bit over the years, as Steel, the debut from Battle Beast, was largely an old school heavy metal album, where the guitars dominated and keyboards were very minor, but with the self-titled sophomore release, and especially with Unholy Savior, he started branching off into different sounds, adding in a ton of keyboards on the latter album especially, while also including more power metal influences, as well as some oddballs, like the surprising 80’s synth pop-infused track “Touch in the Night”. I was interested to see what direction he’d take with Berserker, with it being the beginning of a new band and all, but in the end it’s turned out to be a mostly logical continuation of what he had been doing in recent years, continuing to add in power metal elements as well exploring new sounds, sometimes going even further into pop territory than he had previously, all while writing some of the catchiest songs he has ever written. It really shows how much his songwriting has changed in just six years, because where Steel was very much a guitar driven album, Berseker still has moments where the guitars take over, but they’re largely more in the background, with the keyboards leading the way a lot of time. In fact, anyone who was turned off by the extensive use of keyboards on Unholy Savior is likely to be driven mad by this release, as the keyboards completely run wild most of the time, often teetering the line between extremely epic and incredibly cheesy 80’s style synths, but I find they’re used very effectively throughout the album and help add to the catchiness and wild fun of the songs. This is indeed, the catchiest and most melodic album Anton has written by far, and it’s also easily his most varied release, with everything from mid-tempo heavy metal, to slower melodic metal, speedy power metal tracks, a ballad and one rather surprising track which I’ll describe in greater detail later. 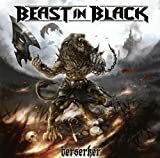 For only having 10 tracks, Berserker certainly never fails to surprise, and yet perhaps the most surprising thing of all is how well everything works, with every song being entertaining in its own way. One crucial aspect of this release is the vocals, and this is where Anton has made his biggest change, switching from female to male vocals, turning to Wardrum vocalist Yannis Papadopoulos, who has proven himself to have an incredibly wide range on this release. He manages to hit some incredibly high notes throughout, using everything from heavy metal wails to the kind of softer, pop-ish vocals current Battle Beast singer Noora Louhimo often uses, and he manages to emulate the latter with surprising effectiveness. He also gets to use some much deeper grunts at times, and some rather deep and powerful lower notes, as well as some extremely animated classic metal vocals. In short, when it comes to powerhouse vocals, he pretty much does it all on this album. Yet, on the rare occasions where he’s asked to sing more softly, he also manages to deliver there as well, especially on the closing ballad “Ghost in the Rain”, where he displays some excellent singing ability, while also putting in a very emotional performance. All in all, this is the kind of breakout performance that should really make listeners take notice of his talents, and throughout the album, he manages to enhance some already excellent songs. Which brings me to arguably the most important aspect of any release, that being the songwriting. The album gets off to an excellent start with the self-titled track, which starts off with some great guitar work and wild screams, before the track speeds up and Yannis dominates with some deep grunts throughout the verses, which he then turns into some wild heavy metal wails during the chorus. Right away, he sets a strong impression, delivering some wildly entertaining vocals throughout the track, while musically the song is fairly up-tempo and is definitely one of the heavier tracks on the album, though keyboards and symphonic elements are still present. It’s an extremely catchy, wildly fun track that gets the album off to an excellent start. 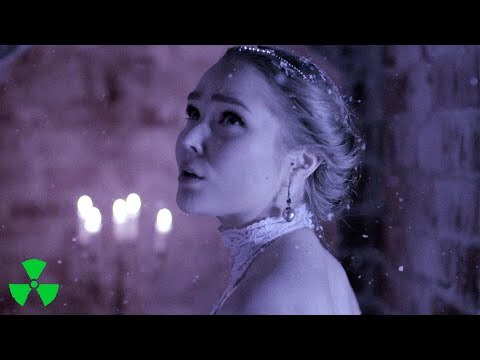 Next is the lead single “Blind and Frozen”, which for many fans was their first chance to hear the band, and it certainly sets a strong impression. It opens with some very cheesy keyboards before the lead guitars take over and it settles into a nice mid-paced groove throughout the verses. Right away, the song shows how keyboard driven the album will be, with some very cheesy but awesome 80’s sounding synths, which dominate the verses, while Yannis opens the track with some very soft, almost feminine sounding vocals, before opening up and going all out during the chorus, where he really showcases his talents. As expected, the chorus is extremely fun and catchy and is definitely one of the highlights of the album. But for me, the best part of the track is the instrumental section, which starts off with a nice guitar solo, before we get an extended synth solo where the synth has a very 80’s sound and is definitely cheesy, but very epic and brings a smile to my face every time. Towards the end of the track, we get the first signs of Yannis’ soft lower register, leading into the final run through the chorus. All in all, while the rest of the album is excellent, this track is for sure my favorite and is probably my absolute favorite song Anton has ever written. After that, we get our first softer song in the album, with “Blood of a Lion”, a slower, keyboard-driven melodic metal track. I was initially thrown off by the sudden switch from more upbeat territory to something this calm and slow, but over time the track has grown on me, as Yannis uses some very effective soft vocals during the verses, while opening up with wilder vocals during the chorus, where the guitars kick in and the melodies are fantastic and very epic. The song gets heavier as it goes on, with guitars showing up during the second verse, though it’s still a fairly calm and melodic track overall, with the catchy chorus being its strong point. Next is “Born Again”, another softer track where the keyboards are even more dominant, and again while the verses are fun enough, it’s the chorus where the song really takes off, with Yannis going all out with over the top screams, which are extremely epic and greatly enhance an already fun and catchy track. One last track that falls into melodic metal territory is “Eternal Fire”, where the triumphant sounding keys give a very Sabaton feel, and it’s a very fun and upbeat track, which moves at a slightly faster pace than the other two tracks mentioned in this paragraph, but it’s still fairly mid-paced and very melodic, with an extremely catchy main synth line as well as an excellent chorus, where Yannis really shines. There’s also a nice guitar solo in the second half, but overall the keyboards are the highlight of the track, and the song has some incredible melodies all around, making it another one of my favorites. Fans of speedy power metal have a few tracks to look forward to, the most obvious of those being “Zodd the Immortal”, a very speedy, hard-hitting track with some slightly thrashy guitar riffs. This is the one song on the album where I barely notice a keyboard presence, as instead, it’s very heavy and guitar driven, and it’s a fairly straight-forward but catchy power metal track, with great vocals, a solid chorus, and a nice guitar solo. It definitely feels like it would have fit in perfectly on Unholy Savior, though here it serves as a nice change of pace after a pair of slower songs. Right after that track is “The Fifth Angel”, another track which would have fit in great on Unholy Savior, with a nice blend of heavy guitars and cheesy, melodic keyboards. It’s another upbeat track with a very fun and catchy chorus, as well as probably the best guitar solo on the album. Lastly, “End of the World” is the most keyboard driven of the faster songs here, with an excellent main synth line, similar to “Eternal Fire”, except it’s a much faster track, and it does have some heavy guitar work during the verses, while Yannis is wild and awesome as always during the chorus, which is very catchy and fun as usual. Out of this group of tracks, this one is probably my favorite, since it comes the closest to the overall feel of the album, while still being very fast paced. Finally, we have two more tracks to talk about, one being a ballad, the other being a total oddity. First up, closing ballad “Ghost in the Rain” is a very nice track which uses keyboards and soft guitars throughout to set the mood, while Yannis uses his softest vocals on the album, expertly switching from high to low notes, and he puts in a ton of emotion, making for an incredible performance that takes what could have been a fairly bland song and makes it an instant highlight. There’s a nice guitar solo in the middle, but it’s the vocals that drive the track, with the final run through the chorus, in particular, being absolutely stunning. Last, and not least, but certainly weird, we have “Crazy, Mad, Insane”, and I could see some fans thinking Anton must have been all of those things in order to write this track, as it’s certainly the last thing anyone would expect from him! Basically, it uses heavy electronic effects, some very cheesy sounding keyboards and dance rhythms throughout, while also using robot voices in the background at a couple key points, as well as using the kind of drums you’d be more likely to hear on a dance album than a metal album. In short, I’d best describe the track as some kind of hybrid between electropop rhythms and techno beats, which is just about the last thing anyone would normally want on a metal album, and yet somehow it works out brilliantly, with the chorus, in particular, being stupidly fun and catchy, and even the techno elements are used so effectively it all just kinda works, in a weird, warped way. 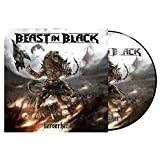 Overall, Berserker is an extremely fun and varied debut, which expertly blends together elements of heavy metal, power metal, melodic metal, and even techno, and it very much continues along the lines of Anton’s work with Battle Beast, while at times going in new and surprising directions. It’s the kind of album where some tracks are sure to turn off certain people, but everything is done extremely well, and it’s certainly going to appeal to a wide audience, just due to how incredibly varied the songs are. As a fan of Anton’s work over the years, I’d say this might be his best album to date, and fans of his should definitely be excited for Beast in Black. Highly recommended for fans of the first three Battle Beast albums, as well fans of heavy metal, power metal and anyone looking for a fun album with a wide mix of elements that all somehow come together in a weird way. No BEAST IN BLACK movie reviews posted yet.